While it's true that Mike Babcock has captured almost every imaginable championship as a coach, there is one major accomplishment that has eluded him. Maple Leafs defenceman Morgan Rielly was asking the question rhetorically in his praise of Toronto head coach Mike Babcock. "What hasn't he won?" Rielly said after describing Babcock as "probably one of the best coaches in sports." While it's true that Babcock has captured almost every imaginable championship as a coach, there is one major accomplishment that has eluded him. He could fill out his trophy case in June after being named a finalist this week for the Jack Adams Award as the NHL's top coach. Babcock has come close but never ultimately won the award. He was runner-up to Patrick Roy in 2014 and finished third behind Guy Carbonneau and eventual winner, Bruce Boudreau, in 2008. Coaching awards often end up going to the person who most exceeds single-season expectations, which could explain why three of the last four NHL winners no longer have jobs. Bob Hartley and Paul MacLean, formerly leading the Flames and Senators, were both fired the year after they won while Roy quit the Avalanche two years after winning. "I do know he's won a Stanley Cup and that there are coaches who have won the Jack Adams [who] haven't won the Stanley Cup," Leafs general manager Lou Lamoriello said when informed that the award was missing from Babcock's resume. A dominant decade in Detroit never was enough in the minds of the NHL's broadcasting class, which votes on the award, but this could be Babcock's year. Not only did the Leafs dress seven rookies nightly — and sometimes as many as nine — but those rookies were empowered in prominent roles. The defenceman who logged the most minutes during the regular season? A rookie: 25-year-old Nikita Zaitsev. The forward who absorbed the most minutes? Also a rookie: 19-year-old Auston Matthews. Toronto's ninth-ranked penalty kill was stocked with first-year players, including Zach Hyman, who led all NHL forwards in short-handed ice time. Matthews, who broke franchise rookie records with 40 goals and 69 points, said Babcock held players accountable. "For myself personally, I think he pushed me especially in the defensive end," said Matthews, one of three Leafs rookies to hit the 60-point plateau this season, along with Mitch Marner and William Nylander, and one of six to muster at least 28 points. Babcock joined Matthews and Nylander together for much of the year to great success and then down the stretch, as Toronto raced toward an unlikely playoff berth, shuffled the responsibility of his defence pairings. He dropped Rielly from the toughest defensive matchups in favour of Jake Gardiner, a switch that benefited both players and the team at large as the Leafs ended the year on a 12-5-1 run. 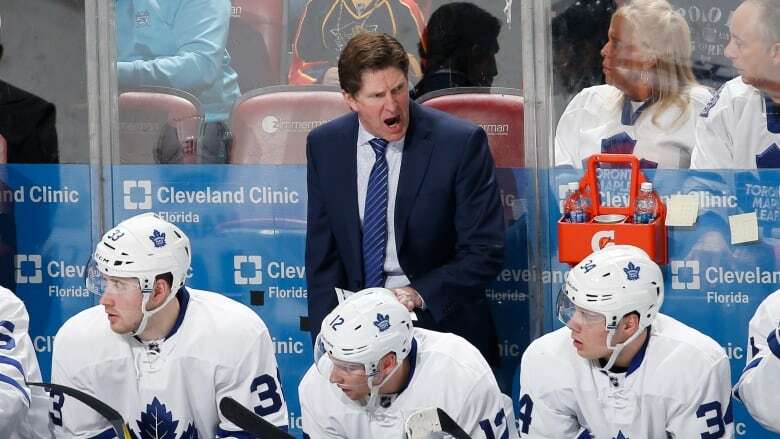 Babcock also spear-headed career years from veterans like Gardiner (career-high 43 points), Tyler Bozak (career-high 55), James van Riemsdyk (career-high 62) and Nazem Kadri, who might be the best individual example of the head coach's work. Early in first season with the Leafs, Babcock assigned Kadri, an inconsistent defensive player, to matchup duty. The 26-year-old embraced the role of combatting the stars of the league and hit career-highs with 32 goals and 61 points. "He understood what he had to do in order to make me an all-around player," Kadri said. "I just worked with him and I knew he was going to make me a better player so I just wanted to totally buy in and listen to everything he was preaching to me." Babcock's credibility that way comes from almost unmatched success as a head coach. He's captured a Stanley Cup, gold at the Olympics (twice), world junior championships and world hockey championships as well as a title on the Canadian university circuit and a World Cup of Hockey. Babcock drove the Leafs to shatter expectations with a relentlessly upbeat approach, his practices whirring from one drill or teaching moment to the next. Toronto only barely cracked the post-season, but jumped 26 points in the standings from last-place in 2016. They were a top-10 puck possession team, owned the second-best power play and had an effective penalty kill. His team played with the lead more than any squad but Washington, a team the Leafs nearly toppled in a first-round series which saw all six games decided by a goal. Pat Burns (1993) is the only Leafs coach to ever win the Jack Adams Award. "He's just super prepared and organized," Kadri said. "If there's one thing, Babs has a game-plan and he likes to stick to that game-plan. He's pretty stubborn that way for sure. I think it's worked. He likes his players to have the same preparation. That's one thing that separates us." Edmonton's Todd McLellan and Columbus' John Tortorella are the other Adams nominees this season.